Hey everybody! Zuby is joined once again by his good friend Alec and they discuss one of their favorite formats in Magic the Gathering! Limited! They go over both Draft and Sealed and some of the choices that are involved in them. 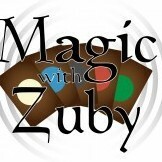 Be sure to listen to it all!Email Zuby at: mtgzuby@gmail.comFollow Zuby at: @MagicwithZuby and @ZubatronIf you have any questions or comments let me know! There really is something different about the older art style. Had more character and a personal touch. Still some great art being done now but still. Wouldnt mind a convo about the secondary market, that would be fun to hear.